I bought this marker for my Father's grave site. He served in the Army and I couldn't get any of the veteran services to place a marker on his grave so when I saw this one, I bought it for him to honor his service to his country. I bought 3 of these military markers 1 for my dad 1 for m friends sons dad and 1 for my friends dad whom all served in the militatay so of corse when I seen these I had to order thinking to my self they would be plastic ..wich they were not.. lols.. I was pleased and so was my friend ..im going to be ordering a couple more for a close friend n a guy I consider a grandpa for many years..ty for offering theres..
wish you had one for all service men. i cant afford to buy them all. My husband pass away and I have the marker in my yard it looks great and I was so glad you had it. you have great customer service people. 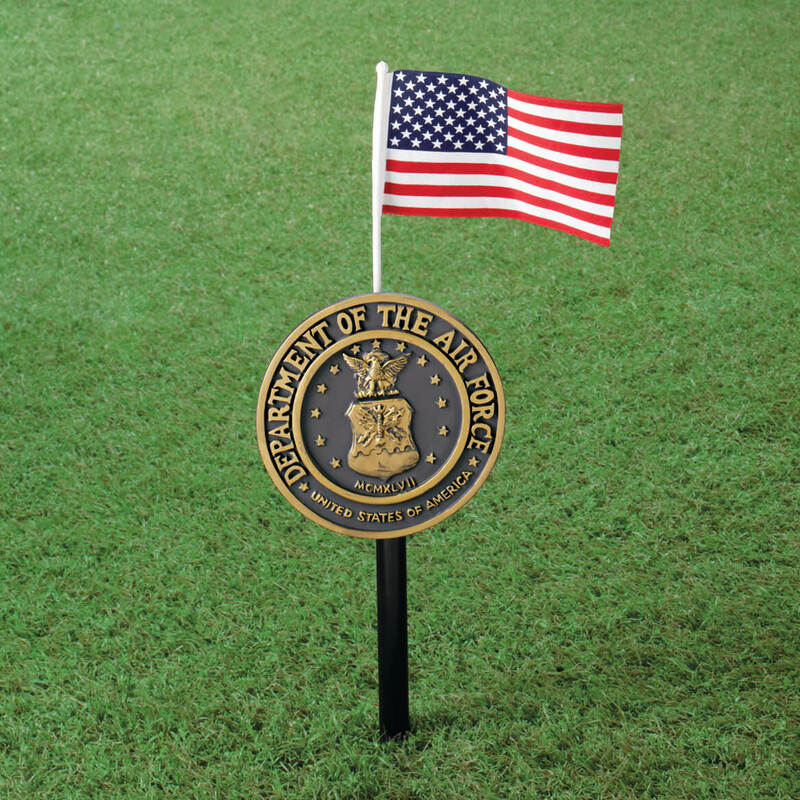 This is the perfect item for honoring a loved one who is serving in the military. it is perfect for honoring a loved one who is not with us anymore. I was surprised how this looks like the real bronze ones. It is a sturdy for use outside where I will use it. We are using them on dads gravesite. Both served in the Army Air Force and this is a wonderful way to thank for their service in WWII. The markers are beautiful and exactly as we expected. We will honor their names for several years. 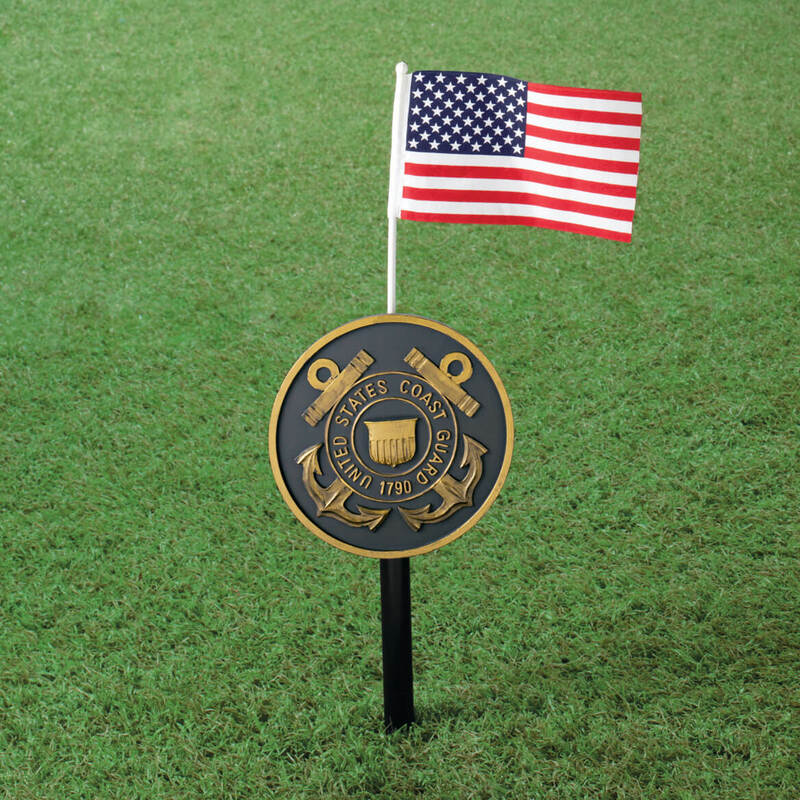 NAVY MILITARY MARKER HITS TARGET! I was very surprised to see the quality of the Navy Military Stake I bought in honor of my husband and 3 grandsons in the Navy. Extreme value for a very low price. Will buy a few more for our large front lawn! I really like the military markers. They seem to be well made and sturdy. The only problem that I see is that one of them had the small screw missing. I will have to find something to make the assembly solid. Other than that, I really like the product. I was impressed by this set at such a cheap price that I bought all five. I have them in my back yard by the pond as a memorial of those that have served. The only thing that I didn't like was where the tiny screw goes into the ground stake. The plastic broke from over tightening the screw. A little super glue fixed it. I did add some 24" flags instead of the 6" flags that were included These would work great during Memorial Day at the Cemetary. I would definitely buy more military related items if they sold them. 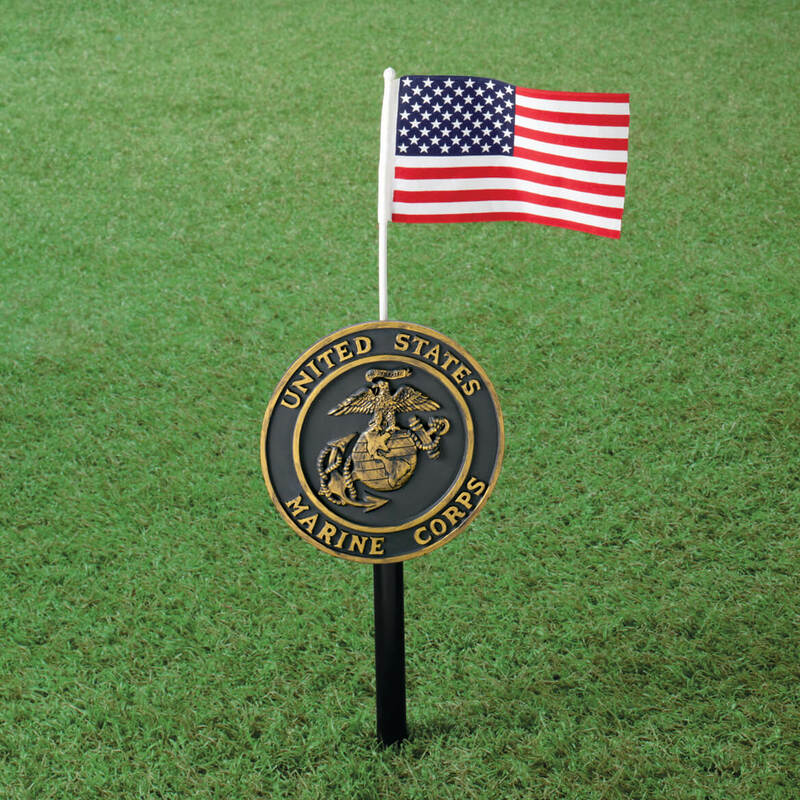 I bought this marker for my dad gravesite to put the flag in. What great about it is big and I hope it stand out at his headstone. Only flaw is that it is kinda wobbly after you put the screw in and plastic behind where pole goes into cracked while I put the screw in. Also the flag is big smaller than I think it would. I hope I find better size flag with dowel to fit in the flag holer. An Awesome Product, but needs to be a little sturdy. I bought several for myself. Satisfied, just had to use strong glue to make it sturdy to stand the weather. Needs to be made stronger. But I do like the product itself. Bought many. The flag should be affixed permanently. Blows away too often in high winds. I liked the item as I wanted something Army for a grave site. I did not like that is constructed poorly. holes for flagstaff too small for staffs on standard flag. The small flag that came with it is not easily replaced and is nonstandard and really flimsy plastic. I liked the size of the marker but the flag was too small to be seen in the cemetery. We found a flag a little bigger that fit the holes. This looks like it is made of metal but it is only plastic painted grey and gold. The piece the rod goes in broke off so I tried to glue it. Glue will not hold the broken piece in place so now what? The flag pole is too thin for the hole and will blow away so I replaced it with a different, wooden-poled flag that I had to sand down to fit. I have no idea how I will put this at the cemetery without the rod to hold it up. Poor construction of connection medal emblem to the pole! These markers were poor construction!! The medal emblem was good but the connection broke off easy! I need to return two of these for replacements! It looked great, but one of the pieces in the back that were supposed to hold the pole that is pushed into the ground, broke in half and the other one came off - they are only glued on. We tried to fix them and glue them back on, back they came right off again. We threw the whole thing away. A waste of money, sorry! Would never buy another even thought they look good. Bought 5 one of the 5 broke apart immediately and the others I had to tape everything down on the back for support. The flag hole is terrible would blow out at the first wind and had to tape that down on the back too. Holder broke right away. Had to glue. when I tried to put the flag in the holder the stem broke. when I went to screw the stake to the top the plaster ring broke right off, also much smaller flag hole than I expected. i purchased 3 Military markers. My father in law's was OK, but at the next Cemetery,my Grandfather's didn't have the 2 holes on back drilled through where the stake was supposed to go through. Then when we went to push the one for his son,( my uncle) into the ground, the hole cut outs sapped right off and there was nothing to hold the resin seal up with. Because not one of them was correct, I felt embarrassed in front of every one that was there since I had bragged about how nice they looked when I first saw them in your catalog and ordered them. Cheap - Easily broken when you screw in the pole. To use this, one has to screw in a provided screw to attach the pole. The plastic snaps and breaks. It can't be used when this breaks. 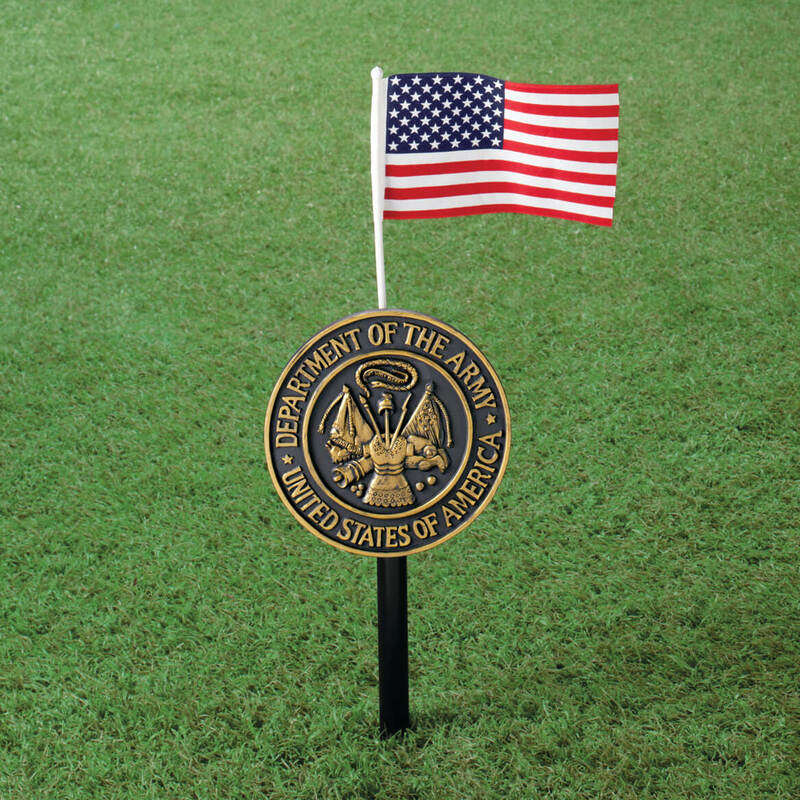 Purchased the military marker for my husband's grave. On the back of the marker were slots where the "poles" were to be inserted. The slots came off and I had to super glue them back on. Disappointed in the quality. Ordered 3 military markers on May 13, 2013. Today is June 4, 2013 and still have not recd 2 Army Military Markers. All 3 were gifts. Only got to give the USAF marker as a gift. My father was my hero and I lost him a couple years ago. I saw this and wanted it for my front garden at my new house. He was proud to have served in the NAVY. for my brother's cemetery stone. To use at the cemetery. It’s a great way to honor our soldiers. My husband is a veteran. My dad served in WWII and I thought the VFW would place a marker by his headstone but they didn't. He was proud of his service and I wanted to honor that. Because I wanted to honor my relatives that served. To give to a neighbor to honor her husband who died. Although this is really a grave marker, we thought it would be something to put in the yard for my brother-in-law who served in the Navy in the Vietnam War. He was not treated very well when he returned, and so we like to honor him when we can. We thought this would be a great way to show appreciation. My father was in the Air Force. We lost him this year so I will place this item at his grave. For my God parents grave, there was one there and now it is gone. So I want to replace it. For my dad who just passed at 99 and will be buried in august. He was in WWII. My husband was in the navy and passed away 15 months ago. I want to place this on his grave site. I wanted this for a grave site. In honor of our parents military service. To honor my husband's military service. Started a Veterans group in our community. These military markers will be a nice addition to the board we are making. I want this item to honor my brother , who served in the United States Army and he has passed away . I thought this would be a great way to memorialize my father who served in the Army during WW II and my brother was a Coast Guard auxiliary. I have a section at home near my flag pole dedicated to them and their service. Father was a WWII Navy Officer passed away and our city puts flags on the graves every memorial day. We needed a marker for my father-in-law and this looks like it will be sturdy. My husband was in the army. My Dad was in the Army Air Corp during WWII but he chose to be buried in a Catholic Cemetery rather then a Military one so I want this Military Marker to show that he Served. Husband and father were in the military and both are deceased. I received my Marine military marker a few days ago and I love it. My husband passed away in Nov. and this will be perfect to put by the wall at the military cemetery. A friend of mine saw it today and I ordered two for her. One for her grandfather and a different one for her father. Thank you for offering this thoughtful tribute for our loved ones. To put on my husbands resting place. Coast Guard items are hard to find. Usually only have the other branches of the service. WONDERFUL MEMORIAL FOR A DESERVING VETERAN. any marine corps in stock? BEST ANSWER: Thank you for your question. Unfortunately the ones listed are the only ones variable. We hope this information will be of help to you. Can these be used as stepping stones? BEST ANSWER: I would not use it for a stepping stone. It is only half the size of stepping stones and I don't think it would last too long for that. 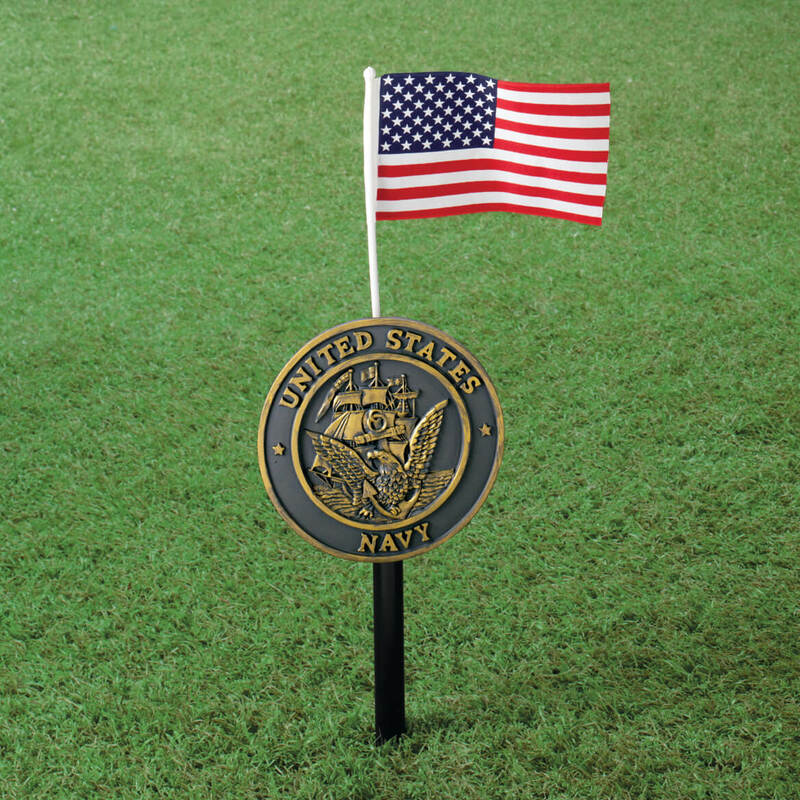 Really nice for just a military marker at a cemetery or a rock garden. Are these markers made of metal? BEST ANSWER: Yes, the markers are metal and very strong. BEST ANSWER: Thank you for your question. 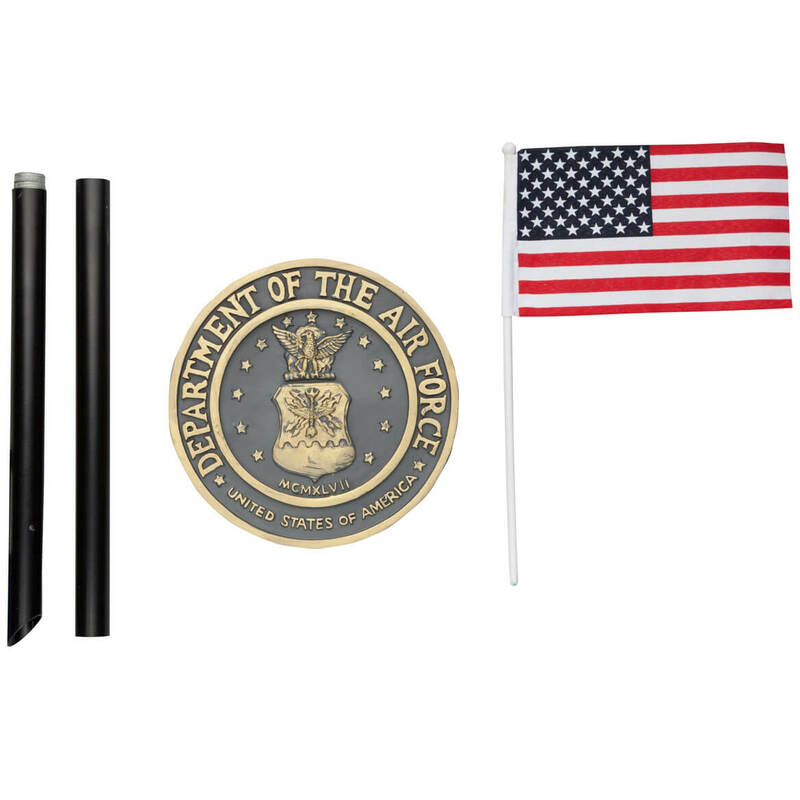 The flag pole is 10” long and the flag itself is 3 ¾” x 6”. We hope this information will be of help to you. When will my cemetary market with navy on metal part arrive? BEST ANSWER: Thank you for your question. The Navy marker is currently in stock. Please select it from the drop down list and click add to cart to order the item. We hope this information will be of help to you.